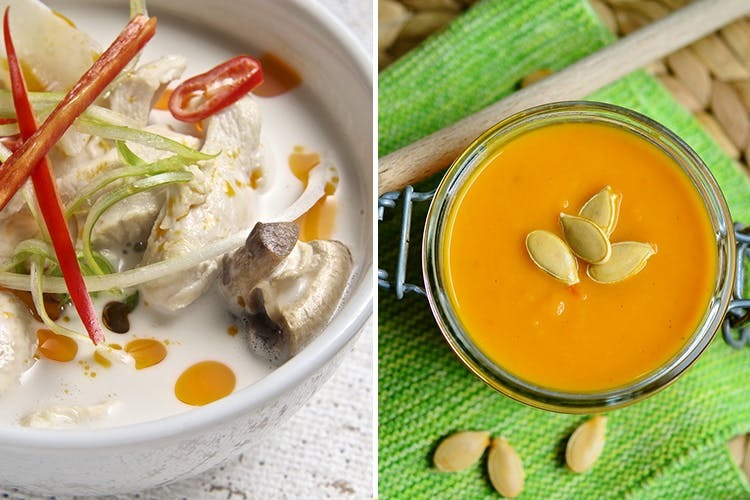 Drinking hot soup in the summer months is just impossible – so we’ve found you 5 cold soups you can slurp on to stay cool. Gazpacho is a cold soup of blended raw vegetables, of Spanish origin. Sante Spa Cuisine in Koregaon Park serves their healthy version of this Andalusian classic, in the form of a chilled watermelon gazpacho, with soaked chia seeds and wine vinegar. If you have dietary restrictions, this one’s for you! Not only is it diet-friendly and healthy, it’s also super light and refreshing. L’Apicio bistro in Aundh is well known for their ‘globally inspired’ fare. Currently, their seasonal menu special is a chilled pumpkin soup with ‘whipped cocoa cream, kale pesto crouton and pepita’ (pepita are roasted pumpkin seeds). This chilled soup is wholesome and tasty and will remain on their menu until the end of the summer months. Also on the summer special menu at L’Apicio, is a watermelon gazpacho. Their version of this classic Spanish dish is close to the traditional recipe, with slight variations made to adapt it to locally available produce. Served with a horseradish creme fraiche, it’s delicious and cooling; ideal to stay cool with, when Pune’s temperature is soaring. This soup will also remain on the menu for the duration of the summer, but they will change their seasonal menu when the monsoon begins. Cafe Du-Mich is a new, open-air restaurant in Mundhwa. Their all-veg menu also features ‘Kaltschale’ – a delightful cold fruit soup, made with a mix of blended fruit juices (pomegranate, orange, pineapple). A German-origin dish, the Kaltschale at Cafe Du-Mich is different from the original (made with wine, beer, and bread) and sounds quite appealing. Cold Cucumber & Dill Soup | Flying Duck Co.
Popular eatery ‘Flying Duck’ (previously in Baner) has re-located to Balewadi High Street, under the slightly modified name – Flying Duck Co. Expect all the deliciousness from before, turned up a notch or two. On their menu currently is a nice cold cucumber and dill soup – which we think is the perfect respite from the summer heat. They are also planning to add one more cold soup to their repertoire – Vietnamese ‘Phở Chua’ – a sour noodle soup with veggies and meat. Currently, there’s a raw mango gazpacho on the specials menu at Indigo Deli in Koregaon Park. We like that in addition to their standard menu, Indigo Deli is always innovating with their ‘specials’ menu – and truth be told, it’s always the best option when ordering food there. Made with raw mango, this gazpacho is gluten free and dairy free; and won’t be available for too long, so we suggest you try it as soon as you can.